I know I’m in the minority here, but I love Terminal.app. It’s my favorite terminal to work in for a variety of reasons – most of them being features that other terminal apps lack, such as the ability to search like you can in a browser window – including multi-line searches. I cannot live without that functionality. There’s also option-clicking to move the cursor and option-click-drag to select text vertically. I could write a whole blog entry that details all the reasons I like Terminal.app, but right now, I’m going to make note of a minor, yet extremely common annoyance I endure when working in Terminal. It’s a somewhat recent bug, perhaps it came about with 10.9, but I’m not sure. As you can see in the example moving gif above, the letters “cmd” get deselected. I usually work around this issue by pausing a second, and then double-clicking the deselected word to re-select it. This bug didn’t used to exist, but has been around for at least a year now. When you command-triple-click a line of text in Terminal.app, the line gets selected, but the word that your mouse was over gets deselected. This behavior is inconsistent with what happens in Text Edit.app, where doing the same thing selects the entire line including the word you were hovering over. I created a screen-recording to document this annoying bug, demonstrating it in both a Terminal window and a Text Edit window (attached). Please fix this so that Temrinal.app’s text selection behaves the way Text Edit.app’s text selection does. It will greatly help me when trying to keep notes on my work. 2. Siri hears me say “Play the Radio Lab podcast” and then tells me she can’t find a podcast named “Lab”. I must say “Play podcast quote radio lab end quote” to get it to work. 3. If you ask Siri to play a podcast that is unsubscribed or has a red ‘e’ on the only listed episodes, Siri says “Playing podcast…” and never plays anything without catching the error. 4. If I play a podcast, it goes through aux, but after using BT, podcasts end up on the headset and can only switch back by replugging aux wire. 1. As you can see in my feedback, I was happily listening to podcasts which Siri was kind enough to start for me. But at some point, I had asked Siri to pause playback, and the next time I asked Siri to resume, or play the podcast again, Siri informed me that I don’t have the latest podcast app installed! I thought, “Wow, they issued a required update in the past 15 minutes since I last got Siri to play a podcast? !”, so I looked on the app store update page and there was no update there for the podcast app. I then searched for the podcast app, and it showed that it was installed and up to date! I don’t know what Siri was complaining about, so I just had to resort to initiating podcasts via touch. 2. Apparently, the word “Radio” is, what we call in the programming profession, a “reserved word”. Siri assumes that “Radio” is not a part of the title of a podcast. I tried numerous times to get Siri to play the Radio Lab podcast before attempting the quote-trick. She had correctly heard me say “Radio Lab”, but refuse to search for a podcast named anything other than “Lab”. It seems that because of one or both of these issues, the podcasts would not play without manually touching the cloud/download icon. However, Siri happily said “Playing podcast…” without informing me of any error. At first, I thought that it was an issue of the audio being routed through the wrong device (headset versus headphones port), but upon asking, Siri informed me that no podcast was currently playing. I did note that using the download button and then tapping an episode to play it would initiate a buffering period, perhaps even a minute long, but I ruled out that as what was happening when using Siri to play an episode by waiting several minutes for an episode to start playing. Ideally, Siri would see that a podcast had been unsubscribed or that none of the current episodes could be played and either inform me of a problem, or offer to re-subscribe to the podcast and retrieve the most recent episode. 4. I was having other issues with Siri-controlled podcasts. Numerous times, I somehow ended up with podcasts being routed through my bluetooth headset. They had started out by default going through the wire plugged into the headphones port even though I had the BT headset on and paired. When the audio unexpectedly switched, I could turn the headset off and audio would go back to the headphones port, but as soon as I turned the headset back on, it would default back to the headset. Eventually, I figured out that I just needed to unplug & replug the audio wire in the headphones port. It seems that there should be a way to tell the podcast app which audio to use. In fact, telling the phone which audio to use should be a feature universal to all audio apps (& Siri). I’m all the time switching the audio for Siri and other apps because the defaults tend to be not what I want. I even try to tell Siri that I want to send the audio to my headset or through the headphones, but Siri doesn’t know how to handle that request. We need more control over the audio and its defaults. If anyone else has had any of these issues, I’d be curious to know how you’ve surmounted them? 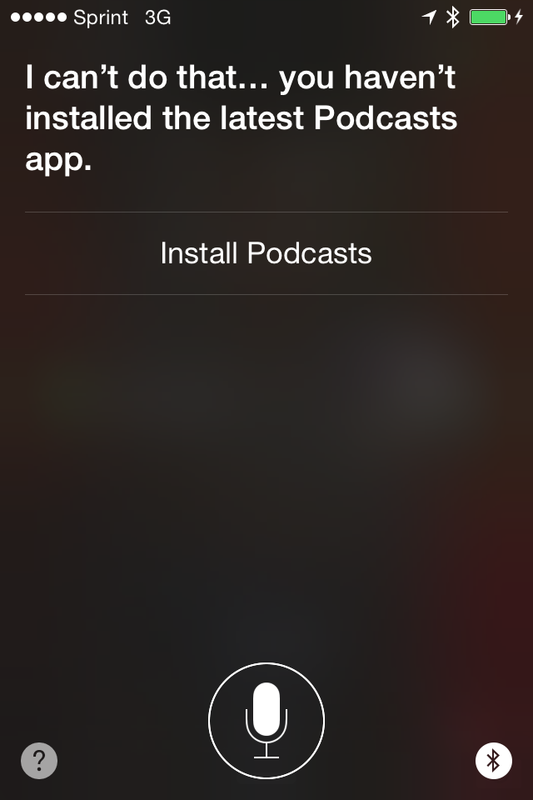 I’m still on iOS 7, so I’d also be interested to know if Siri and/or the podcast app have improved in iOS 8. Today’s Apple Feedback: Siri, re-read that message to me again – Nope. I have a few Siri-related pieces of Apple feedback today, as I just returned from a road trip yesterday as my wife waited for my arrival at home. We were messaging each other during the drive, and having Siri dictate my messages as well as read me messages I’ve received is a terrific feature that I probably rely on too heavily, but it’s so convenient and not to mention obviously safer than actually physically texting – also legal, because it’s hands-free. If you ask Siri to read your messages to you, she speaks the message, but if you happen to receive a message while she is speaking a message, the volume of her voice softens to an inaudible level so that the new message sound can play. What’s more is that if you ask Siri to read the message again, no matter how you try to refer to it (e.g. “previous message”, “last two messages”, or “reread that message to me”…), she will simply read the message that just came in or tell me I have no new messages. When driving, this can be a very frustrating problem. So I think it would be a great enhancement to give Siri the ability to reread messages, e.g. the “last n messages”, “last n messages from my mom”, or “the previous/next message”. Another acceptable solution would be to delay the chime. I simply ended up giving up trying to get Siri to reread those messages and I put off reading them until I stopped for gas or a rest stop – or I would simply ask my wife to send that text again. Of course, this is a first-world problem and for that reason, I considered not posting this feedback, but I am a programmer myself and a perfectionist. I know if I was responsible for Siri’s interface, I would want to fix or at least mitigate something like this. 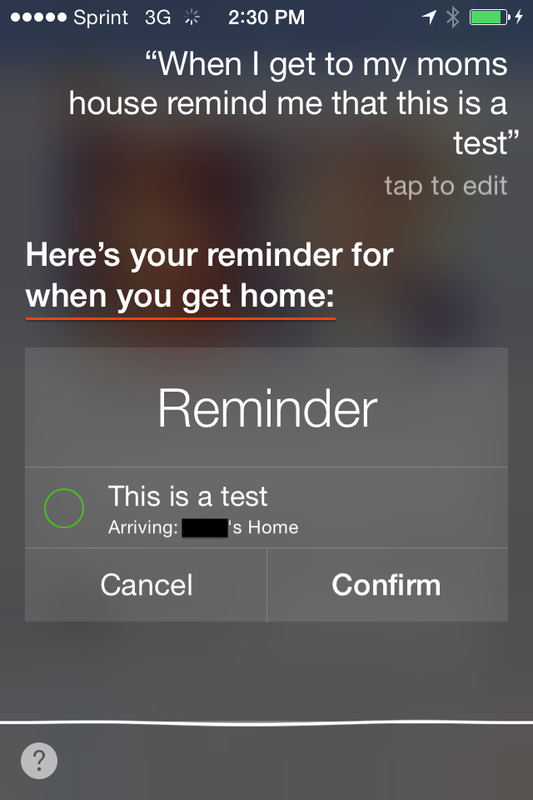 Probably, not many people use all of Siri’s capabilities like I do, especially for reminders at locations other than one’s own home or work, but having an accurate confirmation is very important for safety reasons. Siri knows that places are not my home or my workplace, in fact she displays the reminder with a specification of where the reminder will be triggered, so there’s no reason she can’t say (e.g.) “Here’s your reminder for when you get to your mom’s Home“.